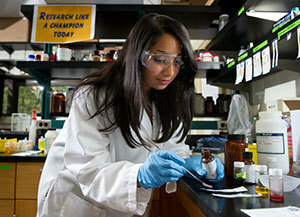 The University of Notre Dame received $113 million in research awards for fiscal year 2014, the highest ever recorded at the University in a non-stimulus year and a $17 million increase over the previous year. Notre Dame received $119 million in 2010, but approximately $30 million was from government stimulus grants through the American Recovery and Reinvestment Act. $23 million from the Bill & Melinda Gates Foundation to fight malaria and dengue fever through research into the effectiveness of spatial repellency in mosquito control. A five-year, $10 million grant from the National Nuclear Security Administration to support the Center for Shock Wave-processing of Advanced Reactive Materials. Over $8 million from the John Templeton Foundation for a number of research initiatives, such as The Experience Project, which will see the Department of Philosophy explore religious and transformative experiences. A $12 million continuation grant from the U.S. Department of Energy for the Energy Frontier Research Center to continue research on actinide materials at the nanoscale, which will support future nuclear energy systems that may create more energy with less waste. In addition, Notre Dame also won awards from the Andrew W. Mellon Foundation, John Simon Guggenheim Memorial Foundation, Lilly Endowment, National Endowment for the Humanities, National Institutes of Health, USAID and many others. Originally published by Joanne Fahey at news.nd.edu on September 19, 2014.